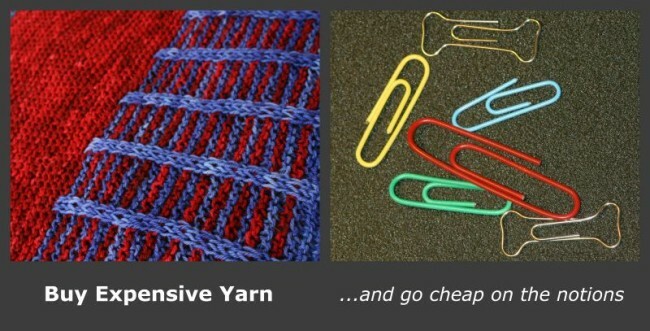 Go cheap on the craft notions and buy expensive yarn. That’s my motto. So this week I’m recommending some cheap alternatives to traditional crafty notions. 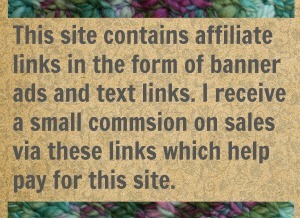 This post contains affiliate links… to really cheap stuff. That tells you how ambitious I am. It boils down to this: if you follow one of my links to amazon and spend about $15, I get enough to buy a can of cat food. I recommend stuff all the time. Why not get a little (very little) something for it? Very few people ever see my notions. Many people (including people all over the interent) see my finished products. If my knitted shawl looks cruddy because I used cheap yarn no one will care that the stitch markers I used while making it had rhinestones. Craft-y notions are small and I am bad with small things. I loose a stitch marker/row marker approximately once every 5.3 minutes. Bad kitties like to steal small things, shiny things, and things that are necessary for my work and sanity. Crafty notions have all of those characteristics and so my notions are constantly being stolen by very bad kitties. I’ve tried to put a stop to that theft but bad kitties are very persistent. Also they seem to be smarter than me. I just let them steal my stuff and go get more. A little baggy of 8 plastic stitch markers is just not worth $4.99. That is a rip off and we all know it. What’s a crafter to do? Go cheap. Here are some ideas. 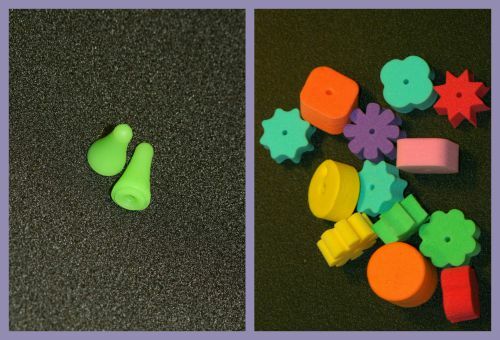 Instead of tips/stoppers for your knit needles, use foam beads. They come by the hundreds and are just as effective at holding stitches on your needles. Stick your needle sin sideways and you can bury the point completely. In crochet it can be tricky (or trickier) to keep track of rows and stitches. Savvy hookers use something like clip-closed/stay-closed row markers for that. But many times a paper clip will work just as well. Steal some from your boss’ office. Go for ones with a nice smooth finish or plastic coating so they won’t snag on your yarn. When you do need something that will clip and stay closed, try coiless safety pins. They are the same thing as those plastic jobbers but they sell for less. Don’t ask me why. In craft stores they are sometimes in with the jewelry findings and sometimes in the the sewing notions. You may have to hunt around a bit. I use cheap and improvised craft notions. For that I’ve been called everything from clever to ghetto. Lol. I don’t much like being called ghetto (who does?) but it doesn’t stop me. Money is better spent on yarn. If you have any cheap alternatives for crafters of your own I’d love to hear about them. That’s what the comment section is for. 15 Comments on "Weekly Rec – Go Cheap on the Craft Notions"
Very luck you are. Someone in your life must know how to buy good Christmas presents! Anytime! And yes, your stitch markers were taken by the cat. Mine has taken hundreds and someday I will find out a) where she puts them and b) why she needs so many. This is not my idea but I saw it somewhere online. I use pencil grips instead of buying the ones that supposedly are crochet hook grips which actually don’t work. Or make grips on the rainbow loom. Lol, perfect timing! 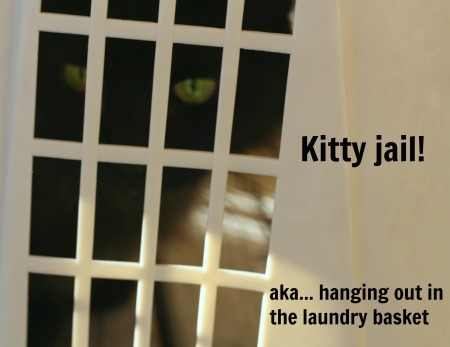 I was working on a post about clothespins when I took a break to read this. Necessity is the mother of… and all that. Pretty toys are nice but pretty yarn is better. 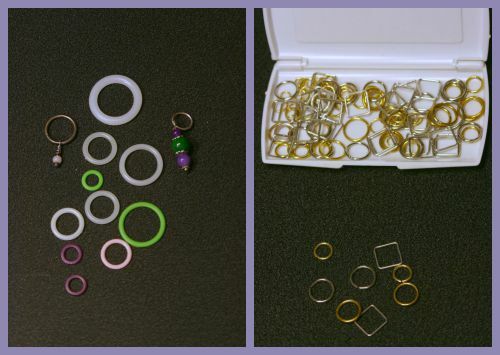 My favorite stitch markers are the rubber O rings sold by the big package in most hardware departments! And, when crocheting, I’ve been known to split the O rings, to surround the stitch, or put them on the coilless safety pins to show the spots needed.